The client's love for old farmhouses inspired the design for this project, set in a Trenton, N.C. beanfield. Ultimately, he plans to produce his own NC wine here, from vineyards he’s planted in the surrounding 50 acre working farm. 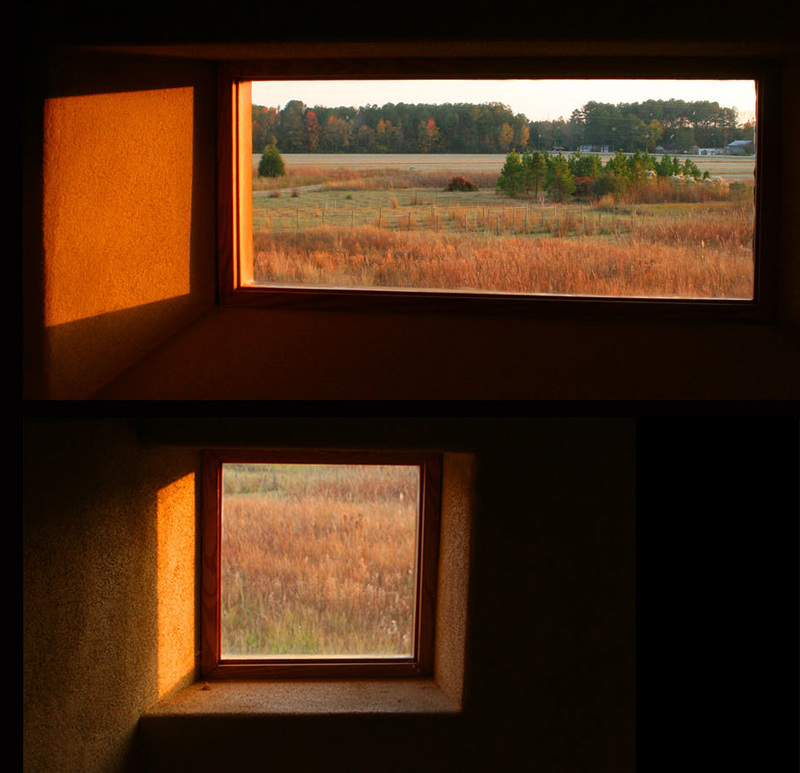 He wanted a house that, when seen from the road, looked similar to other farm buildings dotting the landscape in this rural area of N.C. 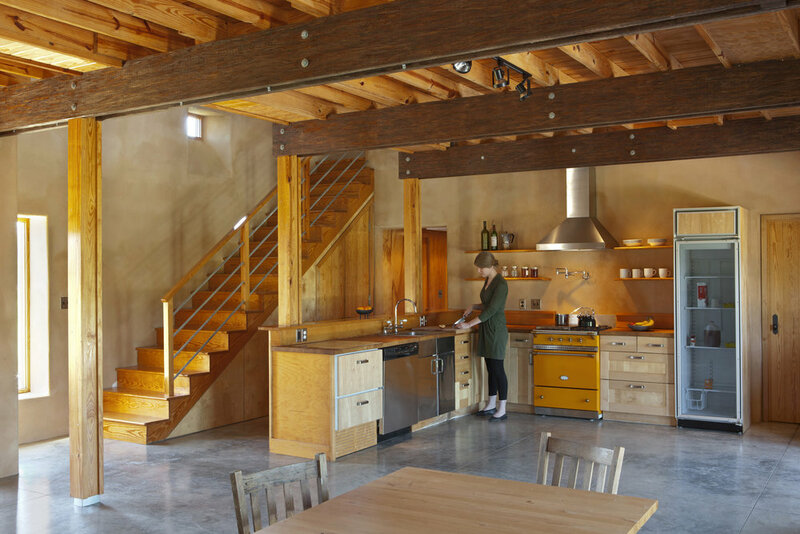 It is comprised of two simple boxes, house and barn, facing directly south, with roofs precisely pitched so that solar panels can be added to heat hydronic tubing in the concrete floor slab. Exterior walls are built of autoclaved aerated concrete block, or AAC. It is a soft material, so we were able to carve openings and joints as we wished, using simple wood saws. 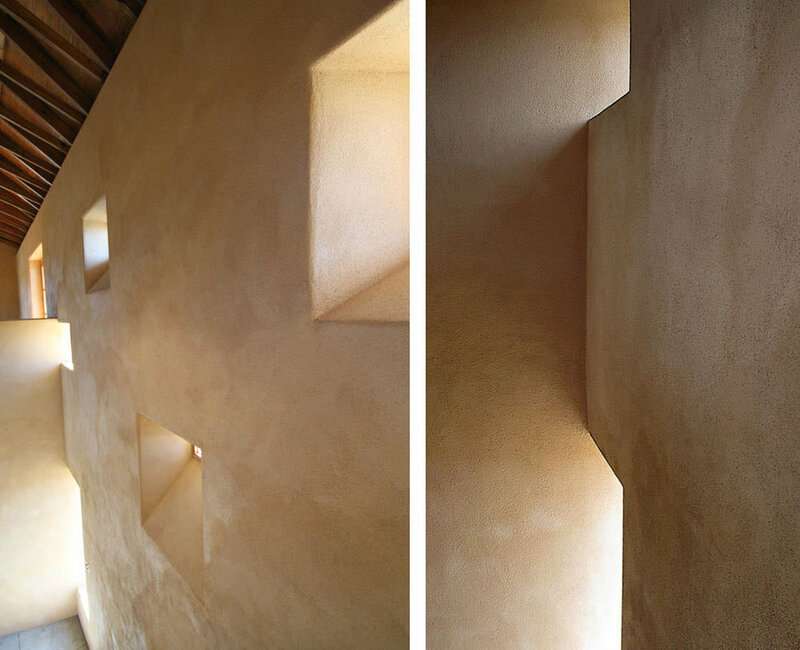 It requires only plaster as a finish, both inside and out, which we colored to match the local "marl" of the roads here. A truly green material, AAC is recyclable and airtight, simultaneously providing structure, thermal mass, and insulation. With "mass-enhanced" R-values between R 20 and R 30, depending on the wall thickness, monthly energy costs have not exceeded $30 over the course of a year. 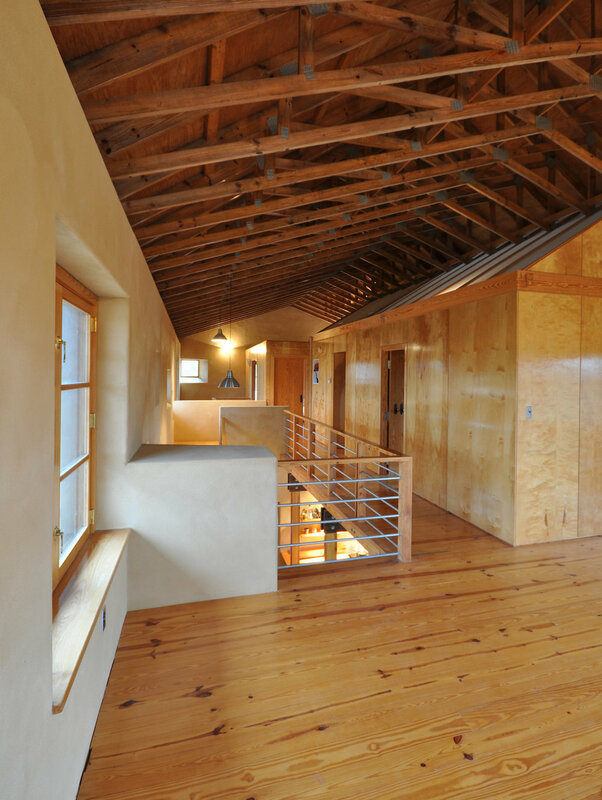 Held within the thick exterior walls is an infill of wooden columns, beams, joists, floor planks, and walls. Bedrooms and bath are built as smaller, wooden "houses” within the larger house, with interior “roofs” of Polygal for acoustical privacy. Per the owner’s request, we used no drywall. 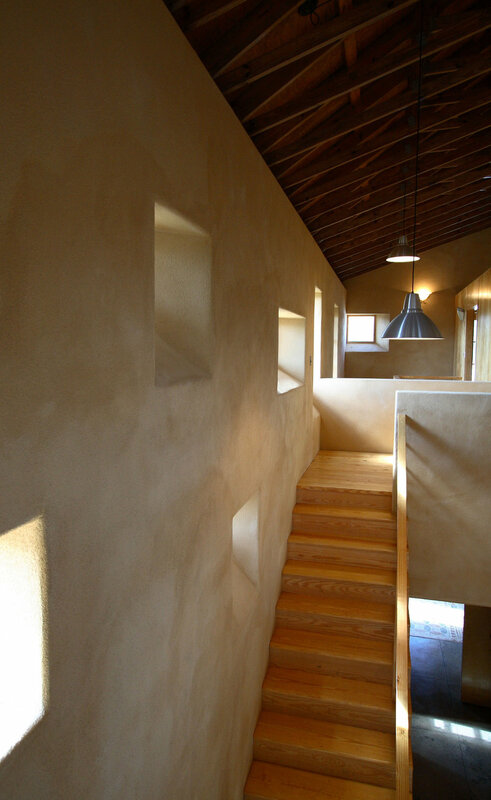 Throughout the house, materials and exposed structure are easily read. 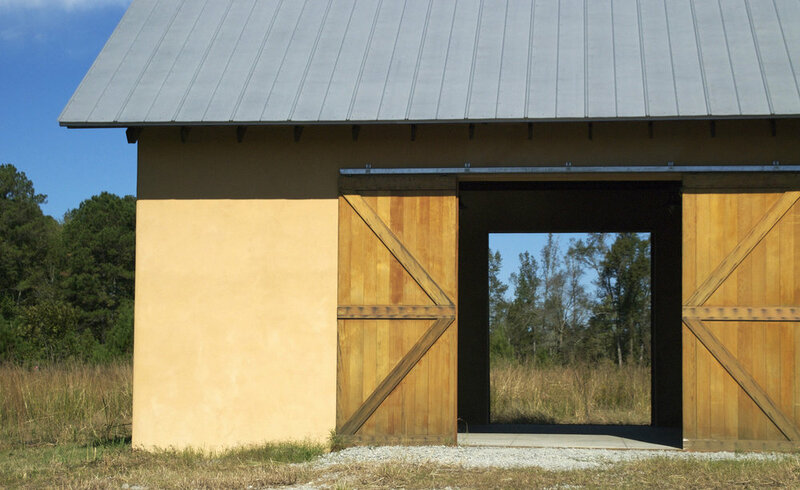 Minimizing finishes, we used simple, off-the-shelf materials such as galvanized pipe rail, pre-fab roof trusses, and exposed fasteners. From the concrete floor to the trusses overhead, there is nothing “extra.” The structure is the finish. Powerfully framed views of the outside are key to the experience of the spaces. Walking up the stair is like being in a tall art gallery, with renderings of earth, plants, horizon and sky arranged on the wall. 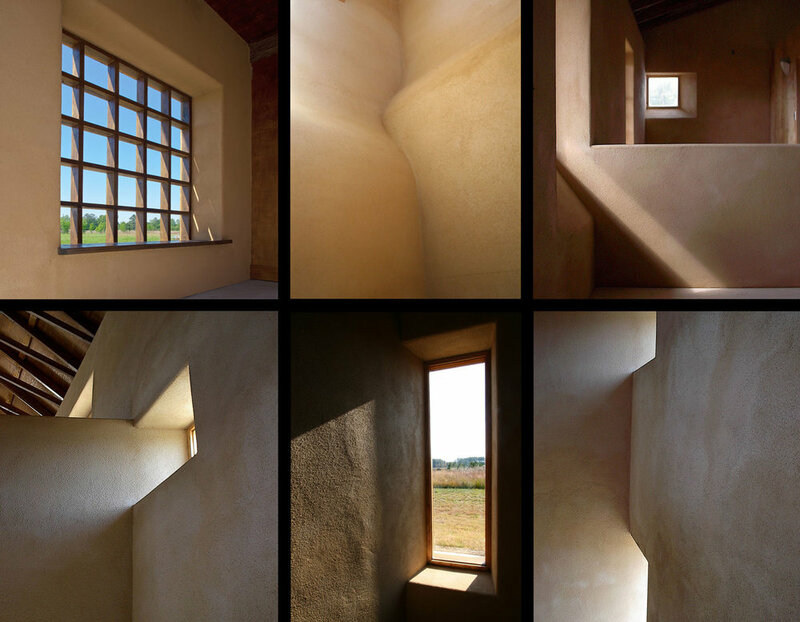 The building acts a frame through which to view the surrounding landscape, a surface for the sun to wash, and a way to capture the ever-changing "paintings" of the outside.